By Fr. Deacon Ezra – 256 pgs. An Orthodox Catechism For Our Times. 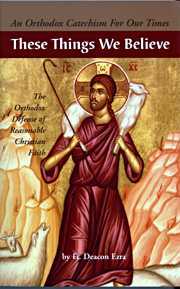 The Orthodox Defense of Reasonable Christian Faith. This is a book with the big answers to the big questions every person asks themselves about faith, science and doubt. It is perfect for individual or group study, high school seniors and up. Those who have lost, or question their faith will regain it here.